If there's a bare wood staircase in your house, you have the opportunity for a great design accent -- a painted stair runner. If done right, it will have the impact of a carpet runner, but with much more endurance (not to mention it's easier to clean). If the stairs have never been painted, they will need to be primed. This will seal the wood and keep the paint from seeping into its pores. It also makes it more durable. Before you prime the wood, however, make sure you give the staircase a thorough cleaning. Use a vacuum to get all the dust off of the surface. The primer can be any brand, but the finish paint should be made for floors. While priming or painting, keep in mind that you will have to use those stairs to get back up to the top. If you have a long stride you can paint every other step. When the first set dries, prime the remaining steps. That way, you can get back to the top without getting your feet full of primer. Otherwise, just paint the left half of the staircase first, let dry, and then paint the right half. A base coat over the top of the primer is critical. Don’t just paint your runner over the primer, or you will have to tape again to paint the sides of the runner. A base coat should be a neutral color that will blend with your runner paint and compliment your design. Find your design. What colors do you like? How will the design fit into your current décor? You can keep it plain and simple with just a solid color or you can do something more elaborate like stripes. Keep in mind that you will be walking up and down those stairs. If the design is too complicated, your eyes will want to find the pattern and it will make you dizzy when you walk on it. Less is more, in this case. This is where all the tape will come in handy. I would suggest finding a large piece of cardboard and trying your design on that before actually painting on the stairs. Stair runners are typically 24-27 inches wide. 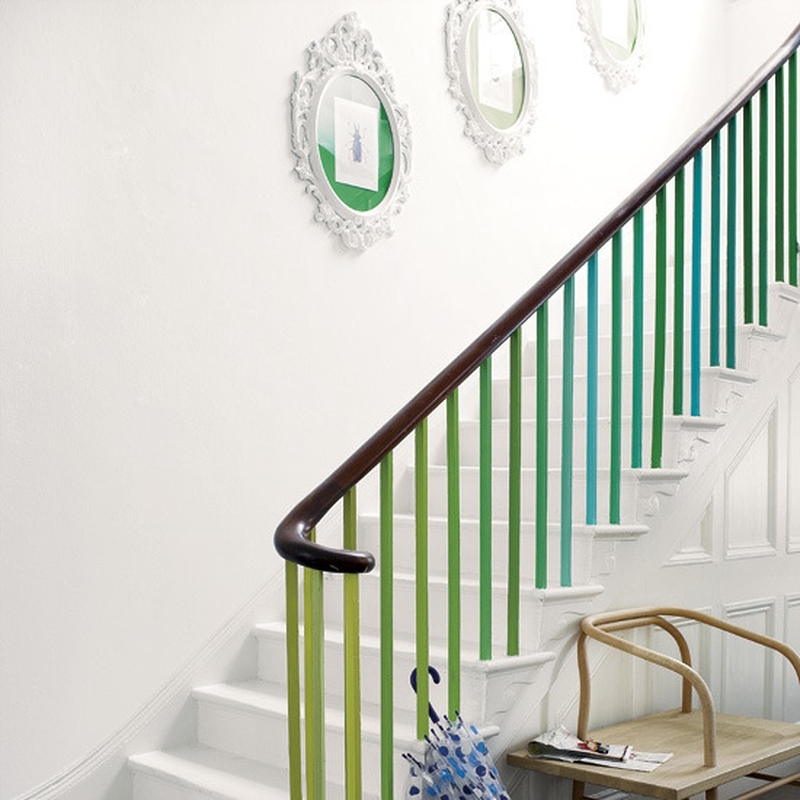 You can paint the whole stair with a wide stripe on either side to distinguish the "runner" shape, or leave the edges bare. Tape the edges of the main stripe. Measure accurately -- you don’t want the runner to look crooked. One way to do this is to make a template out of cardboard. Measure the width of your step. Divide the width in half. That is your center point. If you want your runner to be 27” wide from edge to edge, then divide 27 by 2. This is how much you move out from the center point on each side of each step. Now mark your cardboard with the center point and cut to your desired width. It is a little more work to do it this way, but if you use the side wall of the step to measure, you may find that the wall is not square and will go off course. Once you have the main edges taped, place another stripe down each side about one to two inches off to each side. Whatever you do, do not try to do the taping freehand. Use your templates and measure accurately. Paint away. This is where your creativity comes in handy. Choose your colors carefully. Again, use a paint that is made for floors, which can be tinted to the color of your choice at most home improvement stores. The paint finish should also be either a semi-gloss or enamel. If you choose a good paint, one coat should be enough. You can also add a slip-resistant additive into the paint for extra traction. Now go put on your painting clothes and make your staircase runner happen! Server responsed at: 04/25/2019 8:03 a.m.